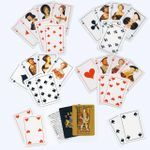 Double deck of Euchre cards with 2 sets of score cards. Can also be used as a single Pinochle deck. Court cards feature historical portraits of the Tudors of England. The Kings are King Henry VIII (Diamonds when he took the throne, Clubs when he was having affairs with Mary Boleyn and Bessie Blount, Spades when he was married to Anne Boleyn, and Hearts during his marriage to Jane Seymore). The Queens: Catherine of Aragon, Mary Boleyn, Anne Boleyn and Jane Seymore. The Jacks, Henry's children: Mary, Henry Fitzroy, Elizabeth, and Edward.